The national park sits on Maya ancestral lands; Greg Ch’oc defiant! On Tuesday, Greg Ch’oc, Executive Director of the Sarstoon Temash Institute of Indigenous Management (SATIIM), came public to say that the Forestry Department has issued the NGO a letter barring it from entering the Sarstoon Temash National Park – a protected area the NGO has co-managed since 1997. But Ch’oc’s message to the Government is that he will not desist – after all, the park sits on Maya ancestral lands to which they have customary rights. The major dispute is oil drilling scheduled to take place inside the national park and on surrounding lands. The company, US Capital Energy, was granted a concession to explore for oil in Southern Belize, and one of their drill sites is within the national park. Ch’oc said that for the last ten months, they have been dialoging with the Government, but no resolution has been reached. “To Miss Lisel Alamilla: I am saddened that none of these letters have been responded to. We refused to be sidelined…” Ch’oc said. “I think they’ve been playing games, and just been dragging this along to say they are going to sign – they are going to sign, and I don’t believe that they have any intentions of signing this,” the minister commented. She said that they had sent a letter to SATIIM on June 5th, again highlighting the need to standardize their contract – a co-management agreement which sets out the terms of engagement between the NGO managing the protected area and the Government of Belize. Alamilla said that Ch’oc had said he could sign the agreement on June 28, 2013, and that they needed an extension because they were in the middle of an organizational reform at SATIIM. No signing took place, and so on July 17, the letter from Chief Forest Officer Wilber Sabido was sent to Ch’oc and SATIIM. Alamilla said that co-management is the framework to manage the 94 protected areas in Belize. Previously, there was no formal framework for this arrangement, and even now, no legal framework exists. Alamilla said that it wasn’t until 2008 when SATIIM took the Government to court over seismic testing for petroleum in the national park that they recognized that the co-management agreements had no legal standing; that they were mere gentleman’s agreements. According to Alamilla, APAMO – the Association of Protected Areas Managers – contracted an attorney to look at the framework, in an effort to get the Government to standardize the agreements and give them legal standing. 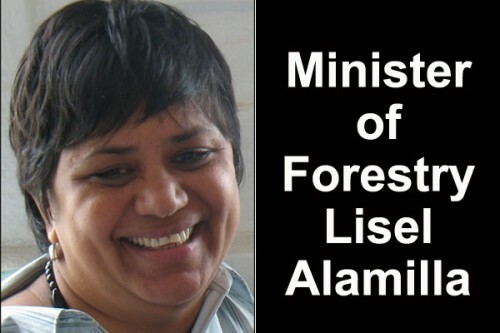 Prior to her appointment as minister, Alamilla headed Ya’axche Conservation Trust (YCT), co-manager for the Bladen Nature Reserve. She told the press that when she came on-board, as a member of Cabinet, last year, she knew it was a priority for the conservation society, and so she took forward the co-management agreements for Cabinet to vet – which they have done. The Minister confirmed today that a number of organizations are inking their signatures on the new co-management agreements. She said that 6 to 7 agreements were signed yesterday. The larger NGOs like TIDE, Ya’axche Conservation Trust, Friends for Conservation and Development are among those listed. However, sources in the environmental community contend that some organizations are signing under pressure from the Government. When asked today about his willingness to sign the agreement, Ch’oc indicated to the press that the matter is out of his hands. “I tabled the co-management agreement to the five buffer communities around the park and they have ordered SATIIM not to sign any agreement until an agreement is reached that is more favorable to the communities,” he said. One of the consequences of SATIIM’s refusal to sign is that funding could dry up. One such funding source is the Protected Areas Conservation Trust (PACT) – a major local donor for protected areas managers. For nearly five years now, the Government and SATIIM have been at loggerheads over the US Capital oil concession and Alamilla said today that, “There was resistance in the past to enter into a co-management agreement with SATIIM because of all the legal ‘wranglings’ that had been happening. “Under my tenure, at no point did I even indicate that my ministry was not interested in entering into a co-management agreement with SATIIM. Whereas it does not look like this impasse will be solved any time soon, Alamilla again extended an invitation for SATIIM to sign the agreement, and she publicly acknowledged that the Government needs the NGO community to help manage the 94 protected areas across Belize.